Alloys International provide a full range of stainless steel and duplex stainless fabrication, repair and maintenance welding consumables, including Stick Electrodes, TIG rods, Cored wires, MIG/MAG solid wires, Submerged arc wires and flux (SAW), ESW electroslag strip cladding strip and flux and Plasma Transferred Arc Welding (PTAW) and Laser Welding powders. AI-0202-TDS AWS/ASME 11C SFA 5.4 E 502-15, 16 AI-0202 is an electrode used for welding of types 501 and 502 straight chromium steels. Principle applications are in the fabrication of equipment for the oil and chemical industries where service conditions require resistance to corrosion and oxidation at elevated temperatures (up to 650°C). Type 502 stainless steel is an air hardening material and when welded with AI-0202 electrodes, a preheat and postheat treatment is recommended. AI-0205-TDS AWS/ASME 11 C SFA 5.4: E 505-15,16 AI-0205 is an electrode used for welding base metal of the same composition. (505 stainless steel), usually in the form of pipe, tube or castings. The material is air hardening, and therefore both preheat and postheat treatment and stress relieving must be used. Excellent resistance to oxidation up to temperatures of 700°C. AI-0207-TDS AWS/ASME A5.4 : E307-16 AI-0207 is an austenitic high recovery, rutile coated electrode for welding 14% Mn steels, armour steels, hardfaced wear plate, hardening steels, and generally all difficult to weld steels. Use AI-0207 for welding and surfacing of rails, depositing 1st layer before hardfacing on 14% Mn steels or on steels with unknown composition. Good for applications with high impact or shock loading. Suitable for strain-hardening, very good cavitation resistance, crack resistant, resistant to thermal shock, resistant to scaling up to +850oC. Heat treatment is possible. Exceptional toughness of the weld metal even at high dilution levels with hard-to-weld steels or when subject to thermal shock. Cryogenic down to -100oC. Stable arc even with AC power. Rutile coated austenitic electrode for welding steels containing 16-21% Cr, 8-13% Ni (Generally type 304 S/S) when easy welding and fine bead appearance are required. Rutile coated electrode for welding steels containing 16-26% Cr and 8-14% Ni. AI 209 is a smooth flowing electrode demonstrating excellent slag control and low splatter. Its high alloy content enables deposits that have optimum tensile - elongation properties. For welding a wide range of stainless steels to alloy steels. Also ideal for rebuilding worn sections prior to hardfacing. AI-0210-TDS AWS/ASME 11C SFA 5.4 : E 310-16 Rutile coated electrode for welding steels containing 20-27% Cr and 18-22% Ni when fine bead appearance and easy working conditions are required. Deposit has excellent high temperature properties. Alloy can be used in air up to 1100°C, in oxidizing sulphurous atmospheres up to 1000°C and in reducing sulphurous atmospheres up to 600°C. It has a scaling temperature of approximately 1175°C. AI-0220-TDS AWS/ASME A5.8: E2209-17 AI-0220 is a SAF 2209 covered electrode with rutile-acid coating for welding of duplex (ferritic-austenitic) stainless steels of UNS S31803/S32205 type (e.g. Sandvik SAF 2205). It is characterized by very good welding properties and gives an austenitic-ferritic chromium/nickel/molybdenum weld metal with an extremely low carbon content for service temperatures up to 250°C (480°F). Spray transfer gives a bead with a finely rippled surface. There is little spatter and very good slag removal. AWS/ASME A5.4 : E 316L-16 Austenitic rutile coated electrode for welding stainless steels containing 16-21% Cr, 10-15% Ni, 2-3% Mo (Generally type 316L) when easy welding and fine bead appearance are required. Deposit has excellent resistance to most corrosive media. Resists intergranular corrosion up to 400oC. AI-0240-TDS AWS/ASME 11C SFA E312-16 Universal rutile coated electrode for welding heterogeneous joints, hardening steels, armour steels and generally all difficult to weld and dissimilar steels. AI-0240 has exceptional weldability, the ability to weld at very low current (thus minimizing heat input) and has automatic slag removal. AI-0247-TDS AWS/ASME 11C SFA 5.4 E347-16 Rutile coated electrode for welding similar material or for a substrate to provide a strong base for subsequent harder materials. Deposit is stabilised with Nb to control intergranular corrosion in corrosive media and at elevated temperatures. AI-0247 has exceptional weldability, the ability to weld at very low current (thus minimizing heat input) and has automatic slag removal. AWS/ASME A5.4 : E312-17 “Weld-All” rutile coated stainless type of electrode especially developed for use on dissimilar steels, hard to weld steels (eg tool steels, spring steels, armour plate and wear plate), unknown steels and for buffer layers under surfacing alloys. AI-0250 provides ultra smooth, very low amperage, porosity free weld in all positions with excellent strike and restrike characteristics, high crack resistivity and automatic slag release. Applications include: tools, dies, springs, gears, frames, cast steel components, and areas requiring heat and corrosion resistance. AI-0261-TDS AWS/ASME A5.4 : E410-15, 16 AI-0261 is a 12% straight chromium electrode used for the welding of type 410 stainless steel in the fabrication of equipment that demands corrosion resistance, good strength and ductility. Type 410 is an air hardening material and therefore requires pre heat and post heat treatments to achieve adequate ductility in the welds. AI-0261 electrodes provide good corrosion and oxidation resistance up to 800oC. It may also be used for welding types 403, 405, 414 & 420 stainless steels. An air hardening Martensitic deposit is to match steels of the 410 and DIN 1.4006 and 1.4024 type. These materials are used in Petro-refineries and chemical plants where high resistance to corrosion and oxidation is required. Resistance to scaling up to 800oC is a feature. This electrode can be used as a surfacing alloy for furnaces and steel plants. Rebuilding of 13Cr rolls is another major application. AI-02507-TDS AWS/ASME SFA-5.4 : E2594-16 AI-02507 is a covered electrode with rutile-basic coating and about 105% metal recovery used for welding of super-duplex (austenitic-ferritic) stainless steels of UNS S32750/S32760 type (e.g. Sandvik SAF 2507 and Zeron* 100). The weld metal has especially good properties under severely corrosive conditions. Examples of properties are: Excellent stress corrosion cracking resistance in chloride-containing media Excellent pitting resistance High resistance to general corrosion High resistance to erosion corrosion and corrosion fatigue Spray transfer gives a bead with a finely rippled surface. There is little spatter and very good slag removal. The electrode has excellent arc stability and fast burn off rate with minimal stub loss. It is also characterized by improved moisture resistance, self-peeling slag, high resistance to porosity and easy post weld finishing. AWS/ASME A5.9 ER308Si AI-1708 is a premium alloy cored tool steel wire designed for hardfacing of tools operating in working temperature range of up to 500-550ºC. It is ideal for hardfacing components subjected to thermal shocks, mechanical stresses and adhesive (metal-to-metal) wear. Applications include: Shear blades, hot punches, hot extrusion dies, mill guides, moulds, camshafts, cable sheaves, sliding metal parts and similar applications. AWS/ASME A5.9/A5.9M ER308H AI-1708H is austenite structure with 20% Cr and 10% Ni. AI-1708H has good strength at high temperature due to higher carbon content and is suitable for welding 308H steel. AWS/ASME A5.9 ER308LSi Stainless; resistant to intercrystalline corrosion and wet corrosion up to 350ºC. Corrosion-resistant similar to matching low-carbon and stabilized austenitic 18/8 CrNi(N) steels/cast steel grades. Cold toughness at subzero temperatures as low as -196ºC. For joining and surfacing applications with matching and similar – stabilized and non-stabilized-austenitic CrNi(N) and CrNiMo(N) steel grades. AI-1708LSi is Austenite with part ferrite. Applications: For joining and surfacing work on cryogenic matching/similar austenitic CrNi(N) steel/cast steel grades. AI-1709LMo-TDS AWS/ASME ER309LMo Weld metal is austenite structure with 23%Cr-13%Ni-2%Mo. Better strength and corrosion resistance at high temperature than 309L due to additional Mo content. Good crack resistance due to moderate ferrite content. AI-1709LSi-FC-TDS AWS/ASME A5.22 E309LT1-1 AI-1709LSi-FC is a flux-cored gas shielded MIG wire developed for high speed all position joining and cladding of stainless steels and dissimilar steels. The deposit exhibits excellent bead appearance in all positions. Tn he slag is removed easily and completely, leaving a weld bead comparable with a good quality covered electrode. AI-1710-TDS AWS/ASME A5.9 ER410 AI-1710 is a gas shielded MIG alloy depositing ferritic-martensitic steel designed to resist metal-to-metal wear, corrosion and thermal fatigue. Applications: Suitable for continuous casting rolls, valve seats, impellers, steam turbine parts etc. AWS/ASME A5.9 ES316LSi AI-1716 is a molybdenum bearing, solid GMAW wire conforming to AWS/ASME A5.9:316LSi classification. AI-1716 can be used for both dip and spray transfer. EN ISO 14343-A: 20 16 3 Mn N L AI-1716FF is a Fully austenitic stainless steel filler metal with typical ferrite content of 0.5 FN maximum. One of the primary uses of this filler metal is for the joining of similar and dissimilar cryogenic steels for applications down to -2690C. 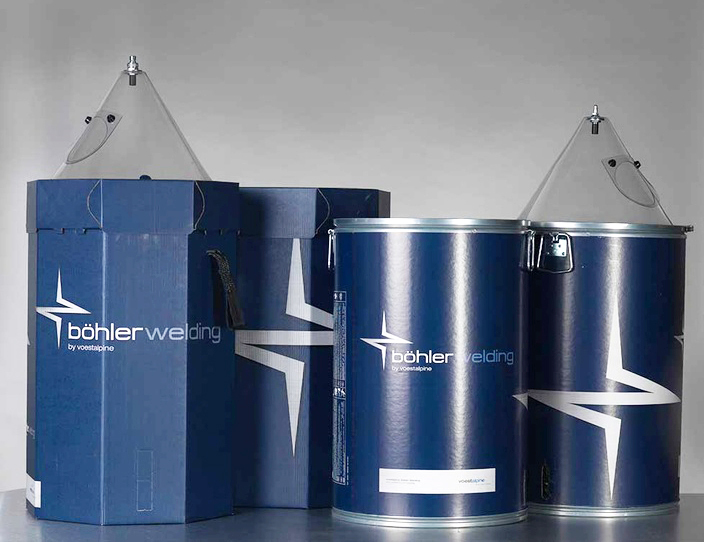 This filler metal also exhibits good corrosion resistance in acids and seawater, and it is particularly suited for corrosion conditions found in urea synthesis plants. It is non-magnetic. The high Mn-content of the alloy helps to stabilize the austenitic microstructure and aids in hot cracking resistance. AI-1716FF may be used for welding, repairing and overlaying of grades of stainless steel like type 316L when weld wear ferrite is needs to be low. E316LT1-4 AI-1716LSi-FC is a flux-cored gas shielded MIG wire developed for high speed all position joining and cladding of stainless steels. The deposit exhibits excellent bead appearance in all positions. The slag is removed easily and completely, leaving a weld bead comparable with a good quality covered electrode. AS/NZS ISO 1434 B SS312 Weld metal is austenite structure with 30% Cr-9% Ni. Superior crack resistance at high strength due to high ferrite content. Good corrosion resistance at high temperature due to high Cr content. It is suitable for welding dissimilar metals, clad steel, stainless steel sheet linings, alloy steel with high hardenability and may be used as buffer layer before hardfacing. AI-1714-TDS AI-1714 is a gas shielded MIG alloy depositing ferritic-martensitic steel containing 13% chrome, 5% nickel and 1% molybdenum, designed to resist metal-to-metal wear, corrosion and thermal fatigue fire cracking. AWS/ASME SFA A5.9 ES307Si AI-1707 for joining: Work hardenable steels, armour plate, austenitic stainless manganese steels, heat resisting steels for temperatures up to 850°C and dissimilar steels. AI-1707 for surfacing: Hot working tools, stainless valve steels, carbon steel items that must possess abrasion resistance in cold working. AI-1709-TDS AWS/ASME A5.22-80 AI-1709 wire has been developed for high speed all position welding of stainless steels. AI-1709 is used when the majority of the work is to be welded in the vertical position. The modified slag allows faster completion of vertical welds with very little loss of the excellent bead appearance in the flat position. X-Ray quality weld beads with smooth flat surfaces can be deposited vertical-up, overhead or vertical down at welding currents up to 200 Amps. The slag is removed easily and completely, leaving a weld bead comparable with a good quality covered electrode. EN ISO 14343-A:G (22 9 3 NL) AI-1720 is a gas shielded MIG alloy depositing ferritic-martensitic steel designed to resist metal-to-metal wear, corrosion and thermal fatigue. Applications: Suitable for continuous casting rolls, valve seats, impellers, steam turbine parts. AI-1607-TDS DIN 8555-UP 8-GF-150/400-KPZ AI-1607 is a submerged arc cored austenitic alloy for welding 14% Mn steels, armour steels, hardfaced wear plate, hardening steels, and generally all difficult to weld steels. Use AI-1607 for welding and surfacing of rails, depositing 1st layer before hardfacing on 14% Mn steels or on steels with unknown composition. Good for applications with high impact or shock loading. AI-1616-TDS AWS/ASME A5.9 ER316L AI-1616 is a Stainless consumable use in the sub arc process. It is resistant to intercrystalline corrosion and wet corrosion up to 400oC (752oF). Corrosion-resistance similar to matching low-carbon and stabilized austenitic 18/8 CrNiMo steels/cast steel grades. For joining and surfacing application with matching and similar non-stabilised austenitic CrNi(N) and CrNiMo(N) steels and cast steel grades. AI-16 Marathon 213 Flux EN ISO 14174 SF CS 2 DC Marathon 213 is a fused calcium silicate flux for submerged arc welding of CrNi(Mo) stainless steel grades. The flux gives a very nice bead appearance without any slag residues.The flux can be applied in multi-pass and single pass welding procedures. The flux provides a high degree of purity in the weld metal and provides good mechanical properties with good corrosion resistance. The flux does not have a Cr-support. AI-1620-TDS AS/NZS 2576-1982, 1645-B1, B7, B5 AI-1620 is specially produced for sub-arc applications where an alloy depositing a martensitic steel containing 13% Cr is required. It is a cored wire used for hardfacing and reclaiming components subject to moderate corrosion and metal-to-metal wear. AI-1620 also has excellent gouging and abrasion resistant properties. The weld deposit is a tough, hard Martensitic steel alloy. It has an attractive combination of excellent corrosion, oxidation/scaling and wear resistance. The weld deposit is machinable with Carbide tools. AI 1620 is used as a cladding alloy on many types of steel industry rolling mill rolls such as table rolls, pinch rolls, scale breaker rolls, coiler rolls, leveller rolls and runout table rolls. Other applications for this alloy are dragline rope sheaves, dragline rope drums, hydraulic plungers, brake drums, certain types of valve seats, pulp rotors and vanes and crane wheels. Although this alloy has a good crack resistance, pre-heat prior to welding and slow cooling after welding is often essential. AI-16601-TDS NB/T47018.4-2011 AI 16601 is a submerged arc flux designed for joining/cladding of stainless steels and low alloy surfacing consumables. AI-16742-TDS DIN 855 UP5-GF-40-C AI-16742 is a sub arc wire designed to deposit a ferritic-martensitic alloy with the addition of nitrogen to enhance the resistance to thermal fatigue and intragranular corrosion by reducing the formation of M23C6 carbides at the grain boundaries. Applications include: AI-16742 has been designed primarily for use on Continuous Caster Rolls in the Steel Industry. EN ISO 3851-A: ER Z18 9 MnMo R 3 2 AI-0207T is an austenitic high recovery, rutile coated electrode for welding 14% Mn steels, armour steels, hardfaced wear plate, hardening steels, and generally all difficult to weld steels. Use AI-0207T for welding and surfacing of rails, depositing 1st layer before hardfacing on 14% Mn steels or on steels with unknown composition. Good for applications with high impact or shock loading. Suitable for strain-hardening, very good cavitation resistance, crack resistant, resistant to thermal shock, resistant to scaling up to +850oC. Heat treatment is possible. Exceptional toughness of the weld metal even at high dilution levels with hard-to-weld steels or when subject to thermal shock. Cryogenic down to -100oC. AWS/ASME A5.4 ER 308L-16 SME AI-0208T is suitable for welding steels containing 16-21% Cr, 8-13% Ni (Generally type 304 S/S) when easy welding and fine bead appearance are required. AWS/ASME A5.4 : ER 309L AI-209T is suitable for welding steels containing 16-26% Cr and 8-14% Ni. AI-0210T-TDS AWS/ASME A5.9/A5.9M : ER310 Weld metal is a TIG consumable with an austenite structure (25%Cr-20%Ni). Superior corrosion resistance and strength at 1000°C due to high Ni and Cr content. Ideal for welding AlSl 310S steel and dissimilar metals (carbon steel, Cr-Mo steel and stainless steel). Also suitable for low temperature and non-magnetic applications. AI-0220T-TDS AWS/ASME A5.9/A5.9M: ER2209-17 AI-0220T is a SAF 2209 TIG consumable for the welding of duplex (ferritic-austenitic) stainless steels of UNS S31803/S32205 type (e.g. Sandvik SAF 2205). It is characterized by very good welding properties and gives an austenitic-ferritic chromium/nickel/molybdenum weld metal with an extremely low carbon content for service temperatures up to 250°C (480°F). AWS/ASME A5.4 : ER 316L-16 AI-0226T is a high quality low carbon rod for the welding of Molybdenum bearing stainless steels; in particular matching 316 and 316T alloys. AI-0316T is also suitable for general welding of other 300 series stainless steels including 302 and 304; as well as ferrite stainless steel grades such as 409, 444 and @Cr12. ISO 3581: E 19. 9 Nb R 23 Rutile coated electrode for welding similar material or for a substrate to provide a strong base for subsequent harder materials. AI-0247T has exceptional weldability, the ability to weld at very low current (thus minimizing heat input) and has automatic slag removal. AWS/ASME A5.4 : ER312-16 AI-0250T is stainless type of TIG wire especially developed for use on dissimilar steels, hard to weld steels (e.g. tool steels, spring steels, armor plate and wear plate), unknown steels and for buffer layers under surfacing alloys. AI-0250T provides ultra-smooth, very low amperage, porosity free weld in most positions. It has high crack resistivity. Applications include tools, dies, springs, gears, frames, cast steel components, and areas requiring heat and corrosion resistance. EN 14343-1 : B17 Ferritic 17% Cr strip designed for multi-layers cladding of the 410 family alloys.